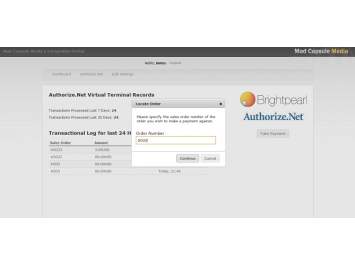 Our Integration Portal for Brightpearl offers a Virtual Terminal for Authorize.net, seamlessly automating the payment process in Brightpearl. Keeping our customers data safe is key, which is why we've made our Integration Portal PCI Compliant. Reducing costs and protecting your business. The only information you need to manually type into the Virtual Terminal is the Sales Order Id from Brightpearl and the customers credit or debit card information. The customers address is pre-populated, Sales Receipt created in Brightpearl and receipt emailed to customer, all instantly and automatically. There is a monthly charge for the service of £20.